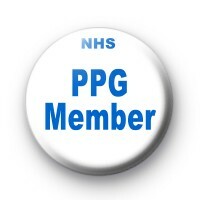 NHS PPG Member badge in white with blue text. Custom NHS badge for Doreen. Standard 25mm badge made by hand in our UK workshop. Patient Participation group badge. We have lots of NHS support badges, badges for nurses and doctors and hospital inspired button badges, so have a browse of the website and select your favourite badges. 25mm button badges made by hand in our workshop.